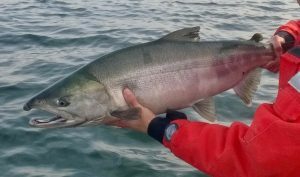 The good news for salmon anglers is two-fold as the chinook fishery reopens in some local marine areas, but the bigger news is what appears to be an extremely strong chum return. “It appears we’re at the beginning of a stronger than forecasted chum run for Hood Canal and South Sound,” said Marisa Litz, a Washington Department of Fish and Wildlife (WDFW) chum salmon biologist. Sport anglers at Hoodsport in Hood Canal saw some good catches of chum this past weekend where 38 anglers on Oct. 21 had 25 chum, and 26 on Oct. 22 had 19. Likewise catches from commercial boats in central and south-central Puget Sound and Hood Canal were scoring good catches too. “We had our initial (purse seine and gill-net) openings last week and this week, and based on our (catch per unit effort) they’re among the largest we’ve seen in the last 10 years,” Litz said. Early boat ticket reports showed some as high as 4,000 chum per commercial boat on Oct. 18, and it appears they remained steady this past week. The total fall chum return is 1,070,968, and a breakdown of that figure shows 492,892 for Hood Canal and 291,357 for South Sound rivers and streams. Other fall chum forecasts are 109,337 for Nooksack/Samish; 6,966 for Skagit; 5,981 for Stillaguamish; 20,53 for Snohomish; 141,893 for central Puget Sound; and 2,061 for Strait of Juan de Fuca. Many rivers are closed to all salmon fishing to protect weak returning stocks. Check the WDFW pamphlet for what is open and/or closed to fishing. WDFW and tribal fishery managers are assessing chum forecasts, and will likely start having conversations to consider increasing the run-size very soon, which could be as soon as this week. Chum salmon – better known as dog salmon for their ferocious-looking jawline at spawning time – are also one of the hardest-fighting fish a sport angler will hook, and they can weigh up to and over 20 pounds with most averaging 8 to 15 pounds. Anglers pursuing chums will have plenty of opportunities along some of the more traditional fishing holes, which will give up decent action in the weeks ahead with the peak usually occurring around Thanksgiving. Popular locales are the estuaries off Kennedy Creek in Totten Inlet, Perry Creek in Eld Inlet, Johns Creek and Canyon Creek in Oakland Bay, Chico Creek estuary in Dyes Inlet and Curly Creek estuary near Southworth. Other good places to try for chum are North Bay near Allyn, Whatcom Creek in Bellingham, McLane Creek, Eagle Creek south of Potlatch State Park, and the public-access shores off Highway 101 from Eldon to Hoodsport. The heavy rain in past couple of weeks has pushed a lot of the early chums toward estuaries where they’ll stage before up into rivers and streams. A bobber and anchovy or small firecracker-sized herring is the most productive way to catch fish, but tossing flies, spinners, jigs and spoons will also catch their fair share of fish. In this fishery many believe the color chartreuse is the “must have” color in your tackle gear to catch chums. The strong abundance of chum also bodes well when northern Puget Sound (Marine Catch Area 9) and east side of Whidbey Island (8-1 and 8-2) reopens for blackmouth on Wednesday (Nov. 1). Anglers at places like Possession Bar and Double Bluff off the south side of Whidbey Island, Point No Point, Kingston, Pilot Point and Port Townsend should find their decent share of fish to catch. In the meantime, for those who just can’t wait until the opener can get a jump start right now for chum and/or other salmon species in south-central and southern Puget Sound and Hood Canal. Central Puget Sound is also currently open for hatchery coho only. Many of these areas restrictions change on Wednesday (Nov. 1) so be sure to check the WDFW pamphlet for what types of salmon you can or cannot keep. Once the free-for-all on winter hatchery-marked chinook gets underway on many marine areas, be sure to put down the 72nd annual Tengu Blackmouth Derby in Elliott Bay on your calendar starting this Sunday (Nov. 5) and will be held every Sunday through Dec. 31. The derby began in 1937, and up until 2015 was held every season since the end of World War II. Last season just nine legal-size chinook were caught during the entire derby. 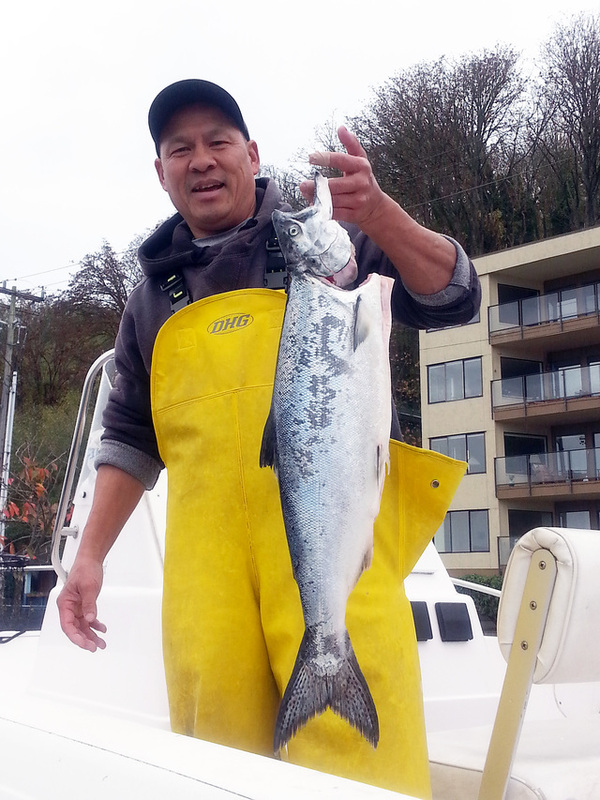 The largest fish was caught by Benny Wong of Seattle, and weighed 10 pounds-1 ounce. Coincidentally Wong caught the most fish for the entire season with three hatchery chinook. A breakdown revealed three legal-sized hatchery chinook caught on Nov. 6; one fish (the season winner) on Nov. 13; one fish on Nov. 20; one fish on Nov. 27; one fish on Dec. 4; two on Dec. 11; and none on Dec. 18. In the derby, only mooching (fishing using a banana-style lead weight to a leader with a herring) is allowed. No artificial lures, flashers, hoochies (plastic squids) or other gear like downriggers are permitted. This winter the boundary has been extended to West Point. Cost is $35 to join the club, and $5 for children 12-years-old-and-under. The derby starts at daybreak and ends each day at 11 a.m. The Seacrest Boathouse will be open at 5:30 a.m. on Nov. 5, and then 6 a.m. every Sunday after that. Cost for rental boat from 7 a.m. to 11 a.m. is $65, and $85 for boat and motor. Tickets will be available at Outdoor Emporium in Seattle. That moves us into squid jigging and this weather outside is the perfect setting although it has been good for weeks now and I’m still hearing that places like the Seacrest Pier and along the Seattle waterfront are the go to spots. Most aren’t big like 4 to 5 inches. High tide like tonight is a plus-10.6 feet at 6:11 p.m. so I’d be there on the pier hitting it hard from 4 p.m. and the few hours after the tide change. It is going to get progressively later as the week goes on into Thursday Oct. 27 before it switches back around. I’d also hit the Shilshole boat launch pier and A-Dock at Shilshole Marina as well as Edmonds, Kingston piers, on the west side try Waterman and Illahee piers, and down south try Des Moines, Les Davis, Dash Point and Redondo piers. For those who don’t fish or just want to see all the chum moving into rivers and streams should take advantage of the action. Kennedy Creek in Totten Inlet offers by far the best sights of chum in spawning action. The creek is located off Highway 101, and is a small low-land stream that flows into southern Puget Sound. 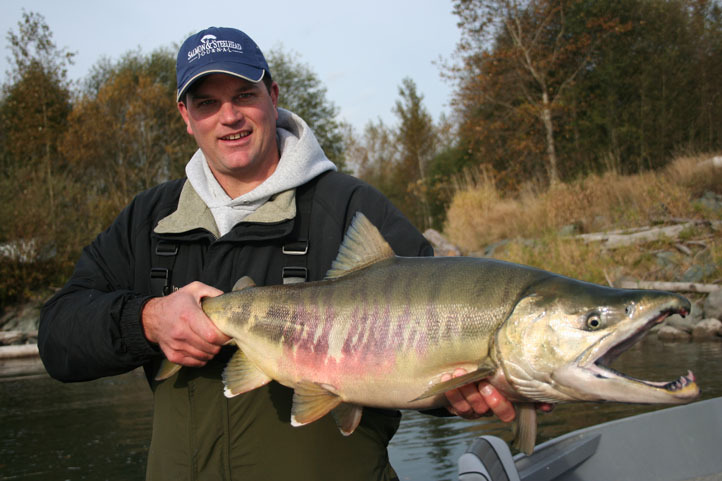 It is one of the most productive chum salmon production streams in the state. 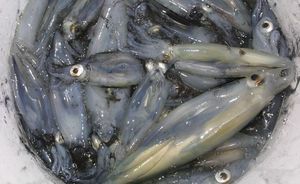 Chum begin appearing between mid-October and mid-December, and best viewing time is during the month of November. The Kennedy Creek Salmon Trail provides a unique opportunity, and was created by the South Puget Sound Salmon Enhancement Group. There are easy access areas, multiple fish viewing platforms, interpretive signs and on-sight trail guides. Chico Creek Salmon Park is located just above the culvert under Kitsap Golf Club Hill Road off Chico Way in Dyes Inlet. You can also see the fish on the bridge near the 19th Hole Tavern on Erland Point Road, and an access point at the end of Kittyhawk Drive. Closer to Seattle, Piper’s Creek at Carkeek Park is a tiny watershed that offers good viewing of returning chum. The best viewing time is primarily from mid-November through mid-December, and peaks around first week of December. In late November there is often a free event called Carkeek’s Annual Salmon Celebration. For details, call 206-684-5999. Can I fish in the Tengu Derby from the Seacrest pier? Or do all Tengu participants need to fish in boats?